Do pediatric hospitalizations have a unique geography? In the U.S. small-area health services research studies are often based on the hospital service areas (HSAs) defined by the Dartmouth Atlas of Healthcare project. These areas are based on the geographic origins of Medicare Part A hospital patients, the great majority of whom are seniors. It is reasonable to question whether the geographic system so defined is appropriate for health services research for all ages, particularly for children, who have a very different system of healthcare financing and provision in the U.S. This article assesses the need for a unique system of HSAs to support pediatric small-area analyses. It is a cross-sectional analysis of California hospital discharges for two age groups – non-newborns 0–17 years old, and seniors. The measure of interest was index of localization, which is the percentage of HSA residents hospitalized in their home HSA. Indices were computed separately for each age group, and index agreement was assessed for 219 of the state's HSAs. We examined the effect of local pediatric inpatient volume and pediatric inpatient resources on the divergence of the age group indices. We also created a new system of HSAs based solely on pediatric patient origins, and visually compared maps of the traditional and the new system. The mean localization index for pediatric discharges was 20 percentage points lower than for Medicare cases, indicating a poorer fit of the traditional geographic system for children. The volume of pediatric cases did not appear to be associated with the magnitude of index divergence between the two age groups. 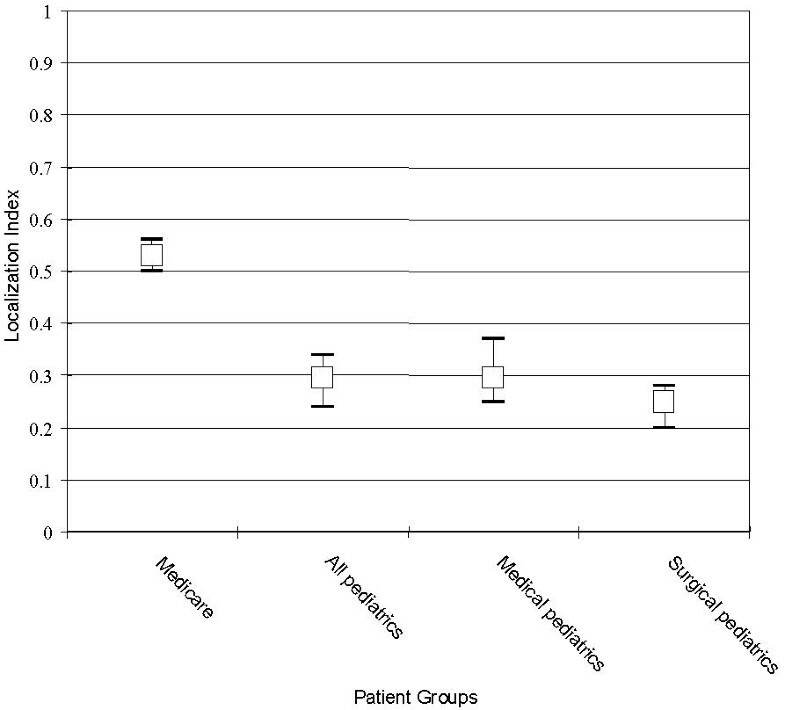 Pediatric medical and surgical case subgroups gave very similar results, and both groups differed substantially from seniors. Location of children's hospitals and local pediatric bed supply were associated with Medicare-pediatric divergence. There was little visual correspondence between the maps of traditional and pediatric-specific HSAs. Children and seniors have significantly different geographic patterns of hospitalization in California. Medicare-based HSAs may not be appropriate for all age groups and service types throughout the U.S.
Studies of regional variation in child health care have identified differences in the supply of medical care resources and in the use of these resources in relation to population need [1–9]. Although small area analysis  is the most widely used method for studying regional variation in child health services, relatively few pediatric studies [2, 3, 6, 8, 9] have been published in contrast to an extensive adult literature [11–15]. Small area analysis first defines local medical service area borders that best reflect patients' utilization patterns. These areas are then used to study geographic variation in healthcare resources, such as the per capita supply of physicians or hospital beds, and variation in utilization levels, such as hospital discharge rates. Although termed small area analysis, the geographic areas reflect the scale of the medical care under study – small for primary care, medium for common hospital admissions, or large for tertiary care (e.g. neonatal intensive care). What is common in small area analysis is that patients are linked to providers and systems of health care through the utilization-based definition of health care market areas. One important example of small areas is the hospital service areas (HSAs; n = 3,436) delineated with Medicare claims data and presented in the Dartmouth Atlas of Healthcare for the 50 states and the District of Columbia [12, 16]. These areas, sometimes referred to as local health care markets, have also been aggregated into larger hospital referral regions (HRRs), based on referral patterns for highly specialized care. A considerable body of literature is based on the Dartmouth HSAs and similarly derived area designations,[2, 14, 15, 17–23] including national studies of variations in utilization rate, expenditures, and resource density relative to population need. Although the Dartmouth Atlas HSAs have been used for small-area analysis of children, little is known about the appropriateness of using these areas for studying pediatric hospitalizations. The U.S. healthcare system is organized and financed differently for children and seniors. For example, Medicare provides universal health insurance coverage for the elderly and allows them to seek service at a wide variety of acute care locations, while a large percentage of children have more limited options because they are uninsured or under-insured. Notwithstanding insurance status, children have a distinctive epidemiological profile, and frequently receive hospital care at facilities dedicated to pediatric services. Therefore the healthcare system serving children may well have different geographic attributes than the one serving the elderly. Validation of Dartmouth HSAs for children would bring an important new tool to the efforts to improve the delivery of care to children. If these areas are not appropriate for use in pediatric health services research, then child-specific areas should be defined. In this paper, we use discharge data from California to test the usefulness of Medicare-defined HSAs for pediatric hospitalization. We then create pediatric-specific hospital service areas, and compare their characteristics to the Medicare HSAs. Pediatric patient discharge information was obtained from the 1993 California hospital discharge database from the Office of Statewide Health Planning and Development (OSHPD). This year was chosen to achieve comparability with the Medicare Part A data from the Dartmouth Atlas of Healthcare, provided by the Dartmouth Center for the Evaluative Clinical Sciences. Only non-newborn discharges 0–17 years old were used. Teenage mothers, identified by an ICD-9 primary diagnosis beginning with V22, V23, V24, or 630–677, were excluded from all analyses, as these are considered obstetric rather than pediatric hospitalizations. Similarly, healthy newborns, identified with any diagnosis in the ICD-9 groups V30, V31, V33, V34 or V37 were excluded, as the location of hospitalization is determined by maternal rather than child needs. From each discharge we obtained ZIP code of residence, ZIP code of hospital and diagnosis related group (DRG). From the 1993 American Hospital Association Annual Survey we obtained pediatric bed count and primary service code for all acute care hospitals in the state. Six freestanding general acute care children's hospitals were identified by their primary service code, '50'. The 1990 U.S. Census STF3b file provided counts of children ≤ 17 years old for each ZIP code. All analyses were performed at the HSA level. Therefore patient-level and hospital-level data were first aggregated to the HSA level using a ZIP-to-HSA crosswalk provided by the Center for the Evaluative Clinical Sciences at Dartmouth. HSAs sometimes cross state borders. Because discharge data for neighboring states was not available, analyses were limited to HSAs wholly encompassed within California. The effect of these exclusions is minimal, as there are no significant population centers along California's inter-state borders. We also excluded HSAs with less than 20 pediatric discharges, leaving a total of 219 HSAs. The HSA variable of interest was index of localization, which is the percentage of patients residing in an HSA that were hospitalized in that HSA. Thus, 100% is perfect localization or 'fit'. Four localization indices were computed for each HSA: one for Medicare Part A discharges (primarily seniors), one for all pediatric discharges, one for pediatric medical DRGs, and one for pediatric surgical DRGs. The reason for dividing pediatric cases into medical and surgical groups was to see if the degree of specialization of care might be a factor in the divergence of pediatric and Medicare geography. Pediatric medical cases (e.g. asthma) usually require less specialization for treatment than surgical cases. The distributions of indices for the four groups over all HSAs were compared using boxplots and index medians with 95% confidence intervals. The method of computing 95% CIs for the medians was developed by the mathematician, William Knight, of the University of New Brunswick. CIs computed in this manner are not precise but are conservative, in that they denote at least 95% confidence. Rank differences between pediatric and Medicare indices were also tested with the more familiar Wilcoxon signed rank test. Finally, correlations between pediatric and Medicare indices were assessed with Spearman's rho. The 20-discharge cut-off for HSA inclusion is somewhat arbitrary. If the cut-off is too low then the low pediatric volume in some of the remaining HSAs could be contributing disproportionately to average divergence across the state. To determine if weak pediatric localization and lack of agreement between Medicare and pediatric indices might be due to a pediatric volume effect we computed index divergence for each HSA. Index divergence is simply Medicare index minus pediatric index. Thus, high positive divergence values would suggest a better fit for Medicare than pediatric data. Spearman's rho was computed between pediatric volume and localization, and between pediatric volume and divergence. Corresponding scatter plots were also examined. HSA-level index divergence was mapped for the entire state and the major metropolitan areas with ArcGIS 8.2 software to visually explore patterns over the urban-rural continuum. The effects of health systems features on Medicare-pediatric divergence were also explored. The effect of the location of children's hospitals within an HSA was examined by noting the rank of those HSAs in the distribution of pediatric localization indices and in the distribution of index divergences. We also considered bed supply effects in two ways. First, we compared HSAs with and without pediatric beds to see if the two groups had significantly different levels of divergence. Our expectation was that HSAs lacking pediatric beds would have less divergence, i.e., seniors and children would be more similarly localized in areas where beds were not routinely reserved for children. A conservative Wilcoxon two-tailed test was employed for the comparison. Next we considered the effect of pediatric bed supply. Bed supply was calculated as the total number of pediatric beds divided by the total number of children residing in the HSA. We computed Spearman's rho between pediatric per capita bed supply and index divergence. Because higher pediatric bed supply is assumed to indicate a greater local commitment to pediatric services and a better service level, we expected a positive association between supply and pediatric localization index, and an inverse relationship between supply and index divergence. We used GIS tools to define hospital service areas for pediatrics (HSAPs) using California 1997 pediatric discharge data, obtained for another project. While not entirely comparable to the 1993 HSAs analyzed above, HSAP borders based on 1997 data should be more useful to the research community. HSAPs were defined as residential ZIP codes aggregated according to the Dartmouth Atlas method. This common method is well described elsewhere, and details are available upon request. In short, the "plurality rule" is used to aggregate ZIP codes that contribute the plurality of their patients to the same hospital or hospital cluster. In other words, ZIP codes are assumed to be related when each contributes a plurality of its patients to the same hospital market. Heuristic methods are used to ensure that all ZIPs belonging to an HSA are contiguous. We computed the statewide mean of HSAP localization indices and compared it to the mean index for HSAs. If HSAPs are to improve the validity of pediatric small area research then the mean HSAP index should be significantly higher (better geographic fit) than the mean for traditional HSAs. This project was approved by the Children's National Medical Center Institutional Review Board. There were 271,951 non-newborn pediatric discharges in the 219 HSAs studied. Medical DRGs constituted 78.92% (214,635) of pediatric discharges, while 20.61% (56,045) were surgical DRGs. Less than one half of one percent (1,271) could not be classified as medical or surgical. Spearman's correlation between overall pediatric and Medicare localization indices was 0.57 (p < 0.0001), a fairly strong positive correlation. However, pediatric discharges had a mean index of fit (i.e., localization) that was 20 percentage points lower than Medicare discharges (33.7% vs. 53.3 % respectively, Wilcoxon signed ranks z = -11. 0, p < 0.0001). 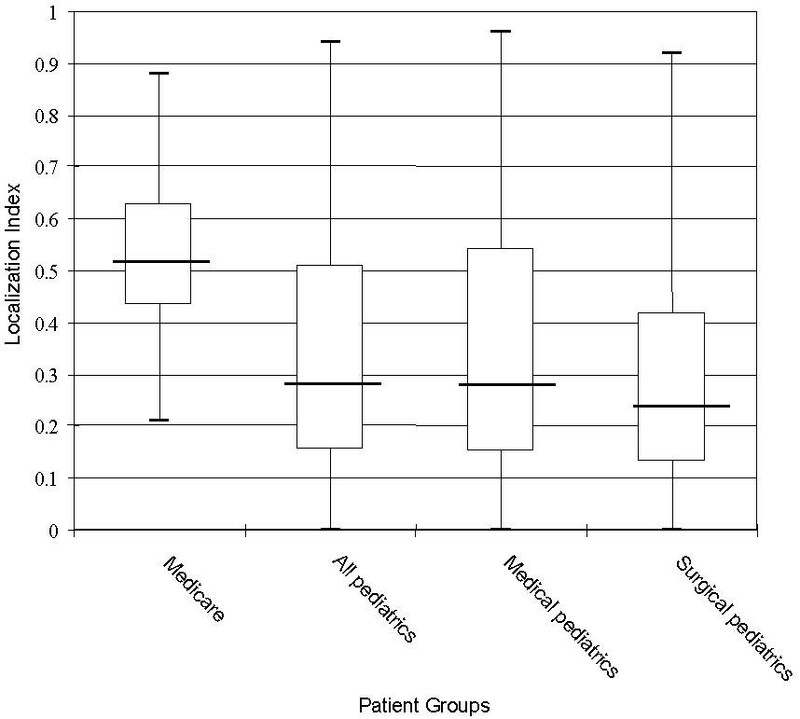 Indices for pediatric medical and surgical DRGs were similar to overall pediatric indices in their means (35.2% and 29.4%, respectively) and relationships to Medicare indices. These Medicare-pediatric differences are depicted in the boxplots of Figure 1. The boxplots show the entire range of a measurement. The medians (dark horizontal bars) for all pediatric discharge groups are well below the median for Medicare discharges. The pediatric interquartile ranges (boxes covering the middle 50% of each distribution) are all situated lower than the Medicare box. Boxplots of localization indices for patient groups for 219 hospital service areas in California, 1993. As can be seen from Figure 1, the pediatric indices are skewed toward the high end of the scale. Some HSAs have zero-value indices. This occurs when all children living in an HSA are hospitalized outside of that HSA. The non-normal distribution of localization indices necessitated that index medians rather than index means be compared statistically. This is done in Figure 2, which shows that the pediatric median indices are all clustered well below the Medicare median and fall outside the Medicare 95% CI, in concordance with the Wilcoxon test results. Localization index medians and 95% CIs for patient groups from 219 hospital service areas in California, 1993. Six HSAs had overall pediatric localization indices of zero. The number of discharges in these areas ranged from 48 to 1,228. On the other hand, the pediatric indices for several HSAs were quite high: 90% for Oakland and 94% for Fresno and San Francisco. All three types of pediatric indices (medical, surgical and total) had wider ranges than the Medicare index. We conjectured that the wider range might be due to low pediatric discharge volume within some HSAs. However, plots (not shown) do not indicate a pediatric volume effect. Spearman's correlations bear this out. The correlation between pediatric volume and pediatric localization is very low (r = 0.10, p = 0.14), as is the correlation between pediatric volume and Medicare-pediatric index divergence (r = -0.03, p = 0.64). Index divergence also ranged widely among the 219 HSAs. For the majority of HSAs the Medicare index was higher than the pediatric index, resulting in a positive index divergence. The Hemet HSA, located west of Palm Springs, had the highest divergence (Medicare index = 0.62, pediatric index = 0.00, divergence = 0.62). However, for some HSAs the pediatric index actually exceeded the Medicare index. For example, the Portola HSA, near Reno, Nevada, had the lowest (negative) divergence value (Medicare index = 0.34, pediatric index = 0.74, divergence = -0.40). Choropleth maps of HSAs, color-coded by Medicare-pediatric index divergence, did not reveal any obvious divergence patterns that might be related to areal size of ZIP codes or HSAs. Neither were patterns discernable along the urban-rural continuum. All six acute care children's hospitals in the state were sited in HSAs having high pediatric localization: Mountain View = 0.51, Orange = 0.67, Los Angeles = 0.76, Fresno = 0.89, San Diego = 0.84, Oakland = 0.90. All of these are in the upper quartile of pediatric indices and the lower quartile for divergence from Medicare: Mountain View = 0.03, Fresno = -0.06, LosAngeles = -0.09, San Diego = -0.17, Orange = -0.18, Oakland = -0.24. Such low divergence values occur when pediatric indices exceed Medicare indices. Pediatric bed supply effects on divergence were also apparent. There were 107 HSAs with some pediatric beds, while 112 lacked pediatric beds. The Wilcoxon signed ranks test value was negative and highly significant (z = -3.49, p < 0.0005.) Thus, HSAs with pediatric beds tend to have poorer Medicare-pediatric agreement than HSAs without pediatric beds. Among the 107 HSAs with pediatric beds, there was a strong negative correlation between pediatric bed supply and Medicare-pediatric divergence (Spearman's rho = -0.52, p < 0.0001). Thus, as per capita pediatric bed supply increased, Medicare-pediatric agreement decreased. Choropleth maps of divergence level by HSA did not suggest any patterns to us. It did not appear that densely populated areas were any more or less likely to show greater divergence than sparsely populated areas. Neither did the heterogeneity of divergence seem to differ with population density. We also examined maps of divergence patterns within major MSAs, including Los Angeles, Sacramento, San Diego and San Francisco. There did not appear to be any consistent divergence patterns within these areas. For example, there was no clear urban-suburban gradient. Applying the Dartmouth Atlas method of ZIP code aggregation to 1997 pediatric discharges, we obtained 145 new hospital service areas for pediatrics (HSAPs), averaging 995 square miles in size. These are fewer and larger than the 223 traditional HSAs, which average 540 square miles. These differences are further evidence of suboptimal appropriateness of HSAs for pediatric small area studies. The maps in Figure 3, for the Los Angeles-Long Beach region, illustrate how the fewer and larger HSAPs (lower map) compare with traditional HSAs. Note the poor correspondence of boundaries. The few service areas with identical borders in the two systems are color-coded. The new HSAPs fit the 1997 pediatric discharges much better than HSAs fit the 1993 pediatric discharges. The statewide pediatric localization index for HSAs was 45.8% versus 63.6% for HSAPs – a nearly 20-percentage point improvement in fit. 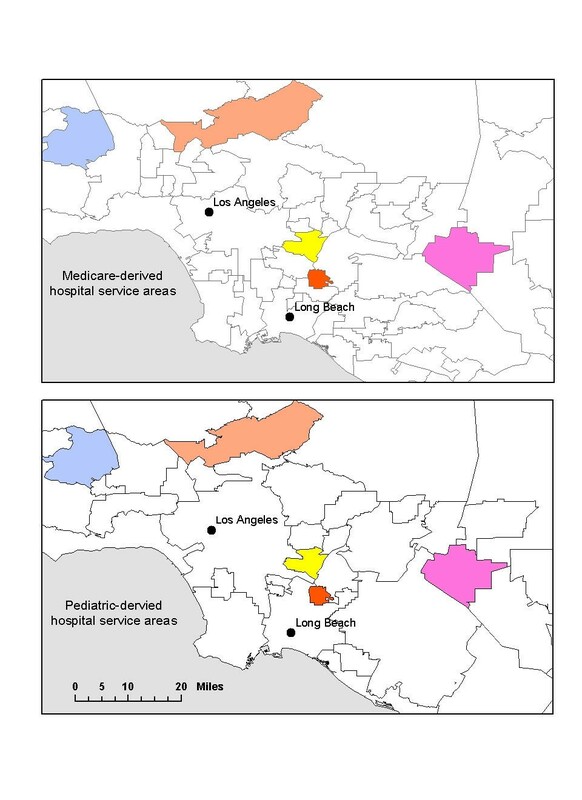 Hospital service areas based on Medicare discharges (top) and pediatric discharges in the Los Angeles-Long Beach area. The few matching areas are color-coded. Radany and Luft  explored a related question with similar data but different methods. They investigated how representative Medicare patient origin data, and geographies derived from it, might be for small area analyses of other age groups. Using California 1987 discharges, they determined, within hospitals, how similar were the origins of Medicare and non-Medicare patients. Their unit of analysis was ZIP code rather than hospital market area. Separately for 455 hospitals, they ran regression models using the number of Medicare admissions from each ZIP code served by the hospital to predict the number of pediatric admissions from the same ZIP codes. A histogram of the 455 hospital-specific R2 coefficients showed that R2 ranged from nearly 0.0 to nearly 1.0. The distribution was skewed, with 55% of hospitals having an R2 over 0.8. They cautiously concluded that geographic origins of Medicare patients could reasonably represent the origins for other age groups under most circumstances. However their histogram shows a large but unknown number of hospitals in the 0.0 – 0.4 R2 range. Whereas Radany and Luft asked the question, could Medicare data be used to construct HSAs suitable for all age groups, we have asked, do the HSAs so derived fit pediatric admission patterns. The answer is not very well, at least for one state and one year. While the correlation between California Medicare and pediatric localization indices is strong and positive, the HSAs for California do not fit pediatric patient origin data as well as they do Medicare data. The degree of 'fit' also ranges much more widely for pediatric discharges. For some HSAs the localization is zero, while for others the pediatric localization actually exceeds the Medicare localization by a wide margin. We have considered two possible reasons for the weaker overall pediatric localization and wider range of fit for pediatric data. The first possibility is that there is a much smaller volume of non-newborn pediatric discharges than Medicare discharges. There were many millions of total Medicare discharges spread over the 217 HSAs, compared to only 271,951 pediatric cases. It might be that stochastic variation among very low volume HSAs widens pediatric localization index range on the low-volume end. However, plots and statistical analyses suggest that this is not the case. HSAs with both high and low pediatric volumes contribute to the wide range at both ends of the localization index scale. The more likely reason for poorer fit of pediatric patients to Medicare-based HSAs is that pediatric inpatient services are organized differently from inpatient services used by seniors in California. The presence of a children's hospital within a traditional HSA is clearly associated with high pediatric localization. Having a children's hospital also appears to contribute to pediatric-Medicare divergence. Five of the six traditional HSAs containing children's hospitals had higher localization for pediatric than Medicare discharges. The logical interpretation is that if an area has a children's hospital, the children of that area are much more likely to use the local point of service. However, because very few service areas have children's hospitals, the presence or absence of a children's hospital explains very little of the overall divergence between Medicare and pediatric localization. Therefore, we examined a different measure of inpatient service organization – pediatric bed supply per capita. The pattern was clear. Traditional HSAs with pediatric beds have higher pediatric indices and greater divergence from Medicare indices than areas lacking pediatric beds. Also, as per capita pediatric bed supply increased so did divergence. It appears that greater local commitment to inpatient children's services tends to keep children in their "home" area. However, it should be noted that, while "number of pediatric beds", an American Hospital Association survey variable, may roughly represents an institution's commitment to children, the variable is not without problems. For example, the AHA questionnaire instructions do not set an age limit for "pediatric". Furthermore, although the questionnaire instructions clearly state that only beds reserved for children should be counted, some respondents might count as pediatric those swing beds that are "for" children but filled by adults as the need arises. Others might not count these flexible beds as pediatric beds. Still, we think it is a useful variable and it performs as expected in our analyses. It is reasonable to expect that spatial agreement between Medicare and pediatric origin patterns would vary depending on the level of specialization of the pediatric service that is studied. Families might be inclined to seek, and payers inclined to support, out-of-area travel for pediatric surgical procedures. This would reduce spatial similarities of Medicare and pediatric utilization patterns. On the other hand, financial and contracting incentives might favor less specialized local inpatient treatment for common conditions such as asthma. For these common conditions and procedures the same hospitals might serve children and adults with equal probability, in effect improving index agreement. However this is not the case in California. Pediatric medical DRGs and surgical DRGs are much closer to each other in median index and range than they are to Medicare patients (Figure 2). Concern about the usefulness of Medicare-based HSAs for pediatric health services research applies over the full range of pediatric inpatient specialty services. Because HSAPs are fewer in number and have a larger average area than HSAs, it can be concluded that children are travelling farther on average than seniors to receive inpatient care. Map comparisons of the two systems, such as that in Figure 3, suggest that HSAPs are not simply aggregations of traditional HSAs. To our eyes the two systems have only a moderate correspondence of borders. This visual sense of discordance extends throughout the state, with few exceptions, for both urban and rural areas. The overall conclusion from our maps and statistical findings is that the de facto inpatient market areas for children and seniors differ significantly, at least in California. The Dartmouth HSAs have proved very useful for small area analyses of adult conditions. In fact they have been used with success for pediatric inpatient studies in Northern New England [2, 27]. In addition, one of us (Goodman) has unpublished data demonstrating that HSAs reflect pediatric inpatient utilization patterns quite well in New York State and Northern New England. Goodman and colleagues have also found reasonable spatial agreement between pediatric and Medicare primary care service areas . However, the current findings show that HSAs are not necessarily well optimized for all times, places or service types. Researchers focusing on demographic groups other than seniors should assess whether there are significant spatial dissimilarities between the health systems for seniors and their group of interest before blindly applying a Medicare-derived geography for their small-area analyses. Children and seniors have significantly different geographic patterns of hospitalization in California. On average, children are travelling farther and participating in a somewhat different inpatient care system. Within the traditional HSA system the strong positive correlation between pediatric and Medicare localization indices suggests that HSAs may be suitable for research into geographic variations in pediatric healthcare resources and utilization. However there is substantial room for improvement of 'fit' for pediatric data. Newly derived hospital service areas for pediatrics (HSAPs) improved the fit of California pediatric discharges by nearly 20 percentage points. Pediatric health services research has benefited greatly from small area analyses based on ZIP codes, counties, HSAs and other areal units. However, at least for California, HSAPs are a better representation of the de facto hospital service areas for children, and should be used whenever possible. The work was supported by grant 1-R03-HS11021-01 from the Agency for Healthcare Research and Quality (principal investigator: MG). MG conceived the study, obtained the pediatric hospital discharge data, performed the GIS operations, participated in the interpretations and wrote parts of the manuscript. KJ performed the statistical analyses and participated in interpretations and wrote the statistical sections. JG participated in the interpretations, provided medical input, and wrote parts of the manuscript. DG provided hospital service area and Medicare data, oversaw the GIS operations, and wrote parts of the manuscript.